Bletilla striata polysaccharide is a natural polysaccharide extracted from the dry tuber of Bletilla striata (Thunb.) Reichb. f. It is a type of natural hydrogel also known as Bletilla gum mainly comprising β-1, 4- mannose and β-1, 4-glucose. It is hydrophilic with the structure of rich active hydroxyl groups. After the introduction of hydrophobic cholesterol succinyl, it becomes a modified polysaccharide (CHSB) with amphipathy. Then the drug-loaded nanoparticle is prepared through dialysis with Paclitaxel (PTX) as the model drug, and its form is observed using Transmission Electron Microscopy (TEM). Its particle size, particle size distribution and zeta potential are tested with a Dynamic Light Scattering instrument (DLS). The entrapment rate and drug loading rate are determined by High Performance Liquid Chromatography (HPLC), and it’s in vitro release condition is investigated to establish the relationship between the entrapment rate and drug loading capacity, in vitro release and the substitution degree of modified polysaccharide cholesteryl. Paclitaxel (PTX), modified polysaccharide (CHSB), blank nanoparticle and drug-loaded nanoparticles are characterized by the differential scanning calorimetry method (DSC) and X-ray Diffraction method (XRD) so as to confirm the existing form of drugs in the drug-loaded nanoparticles. Finally, the in vitro antitumor activity and cell uptake of nanometer particles is investigated. As a natural plant polysaccharide extracted from the tuber of Bletilla striata, Bletilla polysaccharide itself has certain biological properties such as anti-inflammation, antitumor and promotion of clotting. In recent years it has been used as drug carrier in more and more research. Xiangwen et al. prepared cationic Bletilla polysaccharide using the amination reduction method and then prepared its carrier gene complexes . The in vitro test showed its combination with plasmid DNA and protection of it, which can realize the targeted transfection of living donor liver cells. Yuxian prepared the amoxicillin-loaded Bletilla polysaccharide bio-adhesive sustained-release capsules using Bletilla polysaccharide as the carrier and with amoxicillin as the model drug, which not only played the role of Bletilla polysaccharide in physiology and pharmacology, but also played its role as drug carrier . Modified polysaccharide has a good prospect of development and application as a drug carrier. On one hand, this is based on the excellent characteristics of polysaccharide itself, such as safety without toxic side-effect, good biodegradability, low price and availability whereas on the other hand, as researchers research more and more extensively, they have commanded more and more research methods and more and more mature technical operations. Thus, the modified polysaccharide can be developed and applied with sound evidence, which is unceasingly carried out from the exploration at the start through to the scaled industrial production and finally to the product feedback, forming a good development and application model. Paclitaxel (paclitaxe, PTX) is an extract isolated from the bark of Taxus brevifolia Nutt that can inhibit or kill a variety of tumor cells . It is considered to be one of the best natural antitumor drugs currently found. As a microtubule stabilizer with broad-spectrum activity, it can prompt tubulin to be assembled into stable and un-detachable micro-tube bundles and destroy the microtubule function, which in turn affects the function of the spindle and inhibits cell mitosis. Clinical trials demonstrate that paclitaxel has a remarkable curative effect on a variety of solid tumors such as ovarian cancer, breast cancer and non-small cell lung cancer . Because taxol has a high level of lipotropy and is insoluble in water, a suitable solution of injection to dilute it before intravenous infusion needs to be chosen . The dosage forms currently listed are paclitaxel (Taxol®) and paclitaxel liposome (Lipusu) injection. Because paclitaxel injection has demonstrated a series of negative side effects such as bronchial spastic dyspnea, hypotension, leucopenia and urticaria in clinical use, and the incidence rate is as high as 40%, this greatly restricts the application of the preparation in clinical practice [6-10]. Lipusu appeared on the market in China in 2004. It has relatively few side effects, but its price is 2-3 times of that of Taxol, and it is not covered in the scope of medical insurance. Therefore, it is not the preferred drug for most patients. This reflects the necessity to research and develop the Taxol drug delivery system; only through the constant progress of technology can the cost of the industrialized production of new dosage forms be reduced so that the drug is affordable for the majority of patients. This study optimized the process of the extraction of Bletilla striata gel, the synthesis of cholesterol succinyl Bletilla striata gel and the preparation of self-assembled nanoparticles of cholesterol succinyl Bletilla striata gel, characterized selfassembled nanoparticles of cholesterol succinyl Bletilla striata gel and conducted research on in vitro antitumor activity, which yielded stable extraction rate and feasible synthetic technology and thus laid a solid foundation for the research of the new dosage form of Taxol. CP225D micro-electronic balance (Beijing Sartorius Instrument System Corporation), CQX25-06 ultrasonic cleaner (Branson Ultrasonics (Shanghai) Co., Ltd.), SHZ-D circulating water vacuum pump (Gongyi Yuhua Instrument Co., Ltd.), 79-2 type two-way magnetic stirrer (Jiangsu Ronghua Instrument Manufacturing Co., Ltd.), ZK-82B type vacuum drying oven (Shanghai Laboratory Instrument Works Co., Ltd.), 98-1-C type digital temperature control electric jacket (Tianjin Taisite Instrument Co., Ltd.). Bletilla striata polysaccharide (made in the laboratory), succinic anhydride (Butanedioic anhydride) (Tianjin Guangfu Fine Chemical Research Institute), cholesterin (cholesterol) (Beijing Dingguo Biotechnology Company), 1-ethyl-(3- dimethylamino-propyl) ethylcarbodiimide hydrochloride (Shanghai Yuanye Biotechnology Co., Ltd.), 4- dimethylaminopyridine (DMAP) (Tianjin Kaima Biochemical Technology Co., Ltd.), redistilled water, other reagents are analytically pure. Synthesis of cholesteryl succinyl-Bletilla striata polysaccharide: Take 0.5 g Bletilla striata polysaccharide sample, and dissolve it in 50 ml Dimethyl Sulfoxide (DMSO) for reserve. Take a pre-defined amount of Cholesterol Succinate (CHS), 1-ethyl-(3-dimethylaminopropyl) Ethylcarbodiimide Hydrochloride (EDC) with the EDC/CHS ratio of 1.2 (mol/mol, catalyst), 4-Dimethylaminopyridine (DMAP) with the DMAP/CHS ratio of 1 (mol/mol, catalyst), dissolve in 20 ml DMSO (solvent), stir at room temperature, react and activate for 2 h. Drop the activating reaction liquid into the Bletilla polysaccharide solution, react for 48 h, then stop the reaction. Drop the reaction liquids into 500 ml of anhydrous ethanol, separate out the white precipitate, draw and filter, wash the products with the correct amount of ethanol, tetrahydrofuran and ether respectively, vacuum dry under 80°C, thus obtaining cholesteryl succinyl-Bletilla striata polysaccharide (CHSB). When the amount of CHS is changed, CHSB with different cholesteryl substitution degree is prepared. The reaction equation is shown in Figure 1. 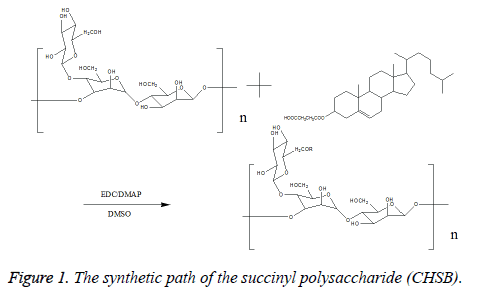 Figure 1: The synthetic path of the succinyl polysaccharide (CHSB). 1. Take 30 mg CHSB, add 20 ml DMSO, reserve after ultrasonic dissolution. 2. Take 9 mg PTX, add 3 ml anhydrous ethanol, and dissolve by ultrasound. 3. Under magnetic stirring, slowly add solution (2) into solution (1), stir for 1 h.
4. Under magnetic stirring, slowly add 120 ml distilled water into the mixed solution in step (3); continue to stir for 24 h.
5. After intensive mixing, transfer the solution into the dialysis bag (Mw10000) for dialysis in distilled water for 24 h.
6. The obtained nanoparticle solution is dissolved with lowpower ultrasound using a probe ultrasonic meter under the ice bath twice (5 min for each time). 7. After freeze drying, save at room temperature for later use. The morphology characterization of nanoparticles: Morphology: Drip the solution of drug-loaded nanoparticle that is newly prepared or re-dissolved and dispersed after lyophilization on the copper wire mesh with carbon support film after proper dilution, drain on the filter and observe it under a Transmission Electron Microscope (TEM) after natural drying . Process the blank nanoparticles using the same method. TEM method can also be used to determine the particle size of nanoparticles. Particle size and its distribution: Pour the solution of drugloaded nanoparticles that are newly prepared or dispersed after lyophilization into the colorimetric cup, put it in the laser particle analyzer (DLS) for detection. Measure each sample three times. Blank nanoparticles are processed using the same method. Zeta potential: The measurement method of Zeta potential is the same as in particle size and its distribution. Drug-loading rate (LC%) and entrapment rate (EE%) [12,13]: Take 3 mg drug-loaded nanoparticles, add 3 ml acetonitrile, process with probe ultrasonic for 15 min (2s, 2s) so that the structure of nanoparticles is fully damaged. Filter through 0.45 μm microporous membrane, and renew the filtrate as the solution of test sample. Determine the content by high performance liquid chromatography; calculate the drug loading rate and the entrapment rate according to formula (1) and formula (2). The form of drug existing in the drug-loaded nanoparticles: X-ray (XRD) characterization of PTX, CHSB, blank nanoparticles and drug-loaded nanoparticles: Place a small amount of PTX, CHSB, blank nanoparticles and drugloaded nanoparticles on the sample plate, roll and spread them as sample layer, measure with the X-ray diffractometer. Test conditions: Cu target, detection wavelength: 1.54 Å. Differential Scanning Calorimetry (DSC) characterization of PTX, CHSB, blank nanoparticles and drug-loaded nanoparticles: Take a small amount of PTX, CHSB, blank nanoparticles and 4-6 mg drug-loaded nanoparticles, heat the sample to 220°C at a speed of 10°C/min, and record the DSC curve of the sample. Calibrate the instrument before using it, and measure the sample under nitrogen protection. In vitro release: Weigh 3 mg drug-loaded nanoparticles precisely, add 5 ml dialysis medium (pH7.4PBS+0.1% SDS) and dissolve it, transfer them to the dialysis bag (Mw10000), tie the dialysis bag at both ends, and immerse it into 20 ml dialysis medium. Oscillate at the speed of 100 r/min at 37 ± 1°C. Draw 1 ml dialysate respectively at 0.5, 1, 2, 4, 6, 8, 12, 24, 36, 48, 72, 96 h, and add 1 ml dialysis medium at the same temperature simultaneously. Determine the content using High Performance Liquid Chromatography (HPLC), calculate PTX content according to the standard curve then calculate the release percentage (Q%) according to formula (3). Sample processing method: Add 2 ml ethyl acetate in each sample respectively, whirl for 5 min, take the liquid at the upper layer after stratification, repeat the above procedures twice, merge the extract and evaporate off the solvent completely under vacuum. Before injection, add 100 μl acetonitrile for re-dissolution, and mix well. Where, Ci: The sample concentration at the time point of Ti, mg/ml; Vi: The volume of medium released at the time point of Ti. Cytotoxicity test: Prepare the solutions of blank nanoparticles with concentrations of 6.25 × 10, 1.25 × 102, 2.5 × 102, 5 × 102, 103, 2 × 103, 4 × 103, 8 × 103 μg/ml, and the solutions of PTX (DMSO with the amount not exceeding 1% of the total volume added to help dissolution) and drug-loaded nanoparticles (measured by PTX content) with the concentrations of 6.25 × 10-5, 6.25 × 10-4, 6.25 × 10-3, 6.25 × 10-2, 6.25 × 10-1, 6.25, 6.25 × 10, 6.25 × 102 μg/ml, and MTT solution with the concentration of 5 mg/ml for reserve. Preserve the MTT solution under the condition of protection from light. Inoculate the liver cancer cells of QGY-7703 that are in the exponential growth phase in a 96-well plate with around 5,000 cells per hole. Cultivate in the CO2 incubator overnight at 37°C. When the cells completely stick to the wall, add 2 μl blank nanoparticle solution, PTX solution and drugloaded nanoparticle solution so that the final concentrations of blank nanoparticles are 0.625, 1.25, 2.5, 5, 10, 20, 40, and 80 μg/ml respectively, the final concentrations of PTX solution and drug-loaded nanoparticles are 6.25 × 10-7, 6.25 × 10-6, 6.25 × 10-5, 6.25 × 10-4, 6.25 × 10-3, 6.25 × 10-2, 6.25 × 10-1 and 6.25 μg/ml respectively, and set up the blank control group. Continue to cultivate the 96-well plate in the incubator for 24 h or 48 h. Take out the 96-well plate, and add 20 μl MTT solution per hole. After 4 h in the incubator, take out the 96-well plate, remove the medium, add 150 μl DMSO, and vibrate gently to mix well. Detect the absorbance value A of each hole using a microplate reader under the wavelength of 490 nm. Calculate the cell survival according to formula (4). Cell survival=The average A value in the experimental group/the average A value in the blank control group × 100%----(4). The cellular uptake experiment: Prepare the solution of drug-loaded nanoparticles labelled with rhodamine B with the concentration of 12.5 μg/ml with PBS, and the Hoechst solution with the concentration of 5 μg/ml. Keep them in dark place, and set aside. Put an appropriate cover glass into the 24- well plate, inoculate the QGY-7703 liver cancer cells with the density of around 50,000 per hole in the 24-well plate. Incubate in the incubator overnight so that the cells can stick to the wall. Place 12.5 μl solution of drug-loaded nanoparticles labelled by rhodamine in the incubator at 37°C for 3 h, wash with PBS three times to remove the nanoparticles that are not swallowed up by the cells, then add 4% formaldehyde solution for fixation at 4°C for 30 min, wash with precooling PBS, repeat the above procedures 3 times. Add 300 μl Hoechst in each hole, incubate in the incubator at 37°C for 5 min and dye the cell nucleus. After incubation, rapidly remove the culture liquid and wash 3 times with the precooled PBS to remove excess dye. Finally, put the cover glass on the object slide, adjust the channel of the laser confocal microscopy to the optimum excitation wavelength, in which the excitation wavelength of Hoechst and rhodamine B is 405 nm and 488 nm respectively, and take photograph. 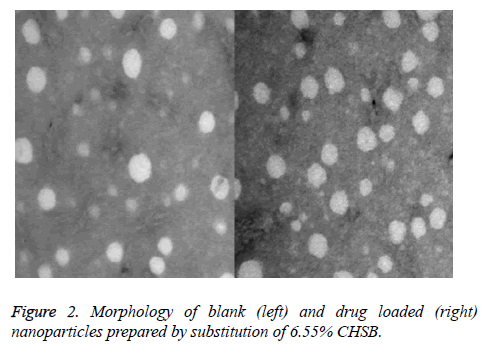 The loaded drug prepared by CHSB with different substitution degrees and the nanoparticles prepared by blank nanoparticles had a spherical shape with no obvious aggregation, as is shown in Figure 2 (Taking CHSB with the substitution degree of 6.55% as an example). Figure 2: Morphology of blank (left) and drug loaded (right) nanoparticles prepared by substitution of 6.55% CHSB. 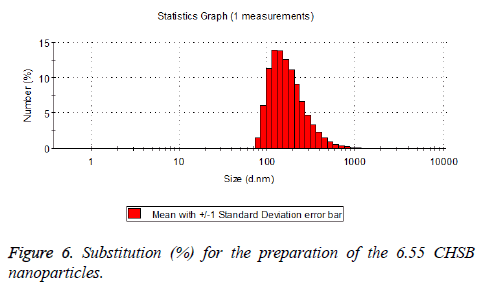 The particle size distribution of the blank and drug-loaded nanoparticles prepared by CHSB with different substitution degrees are shown in Table 1 and Figures 3-8. Figure 3: Replace the blank nanoparticles prepared by the CHSB of 6.55. Figure 4: Replace the empty nanoparticles prepared by the CHSB of 7.30. Figure 5: Replace the blank nanoparticles prepared by the CHSB of 8.91. Figure 6: Substitution (%) for the preparation of the 6.55 CHSB nanoparticles. Figure 7: The nanoparticles of preparation of 7.30 CHSB. Figure 8: Substitution (%) is the preparation of the nano-particle of the preparation of 8.91 CHSB. Table 1. Size distribution of blank and drug loaded nanoparticles prepared by CHSB with different degree of substitution. 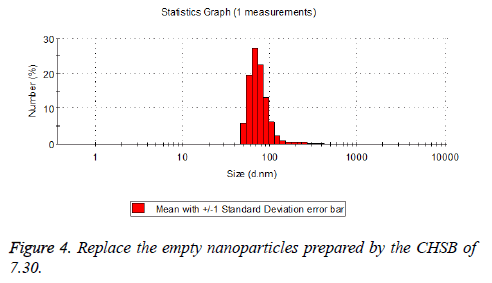 The particle size of drug-loaded nanoparticles prepared by CHSB with the substitution degrees of 6.55 and 7.30 was obviously larger than that of the blank nanoparticles. This might be because the drug entered into the nanoparticles so that its hydrophobic core and the volume of nanometer particle became larger. This phenomenon did not appear in the nanoparticles that were prepared by CHSB with the substitution degree of 8.91, which might be because the substitution degree was too large and therefore the strong CHSB hydrophobicity did not facilitate CHSB to selfcongregate into nanoparticles and the wrapped drug was also reduced. As can be seen from the particle size distribution histogram, the particle size distribution range of drug-loaded nanoparticles is wider than that of blank nanoparticles. The possible reason for this is that the drug loading of nanoparticles measured in the experiment is an average value, but in the case of a fixed ratio between drug and carrier, there are individual differences between the drug loading rates of nanoparticles. This can be seen visually in the TEM photographs. The zeta potentials of blank and drug-loaded nanoparticles prepared by CHSB with different substitution degree are shown in Table 2 and Figures 9-14. 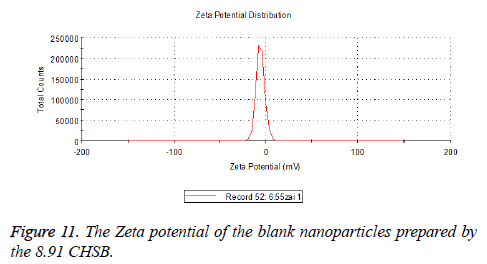 Figure 9: The Zeta potential of the blank nanoparticles prepared by the 6.55 CHSB. 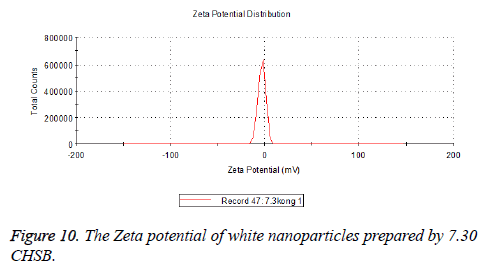 Figure 10: The Zeta potential of white nanoparticles prepared by 7.30 CHSB. 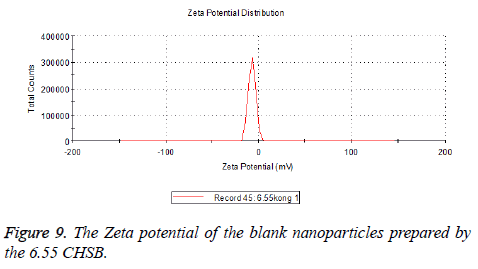 Figure 11: The Zeta potential of the blank nanoparticles prepared by the 8.91 CHSB. 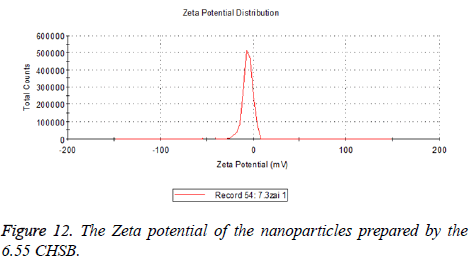 Figure 12: The Zeta potential of the nanoparticles prepared by the 6.55 CHSB. Figure 13: The Zeta potential of the nanoparticles prepared by the 7.30 CHSB. 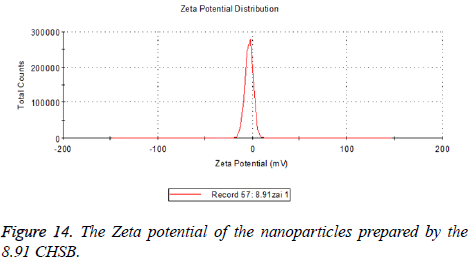 Figure 14: The Zeta potential of the nanoparticles prepared by the 8.91 CHSB. Table 2. Different substituting CHSB for the white space and the zeta potential of the nanoparticles. 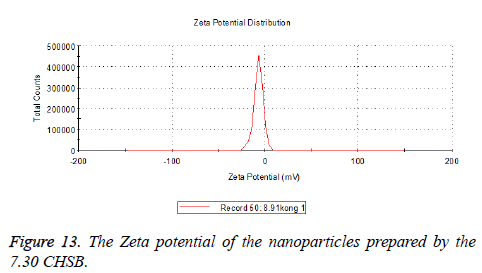 The absolute values of the zeta potential of the prepared nanoparticles were between 2 and 9. The stability of the nanoparticles was also actually investigated in the experiment. After the drug-loaded and blank nanoparticles prepared by CHSB with different substitution degrees with the concentration of 1 mg/ml were saved at 4°C for a month, there was no obvious turbidity and precipitate in nanoparticles, which showed that nanoparticles had good stability. The experimental data shows that the loading and encapsulation rate does not always increase with the increase of the substitution degree. The drug loading and entrapment rates are higher when the substitution degree (%) of CHSB is 7.30 (Table 3). Table 3. The determination of the dosage of the drug and the packet closure rate was determined by different substitutions of CHSB. XRD characterization (taking CHSB with the substitution degree of 6.55% as an example): As is shown in Figure 15, PTX is a small-molecule crystalline material with crystal properties. It showed characteristic diffraction peaks when 2θ were at 5.595°, 8.986° and 12.510° respectively, and there were many small crystal diffraction peaks when 2θ were between 14° and 30°. The blank nanoparticles had no obvious diffraction peaks. In the spectrum of drug-loaded nanoparticles, the characteristic absorption peak of PTX disappeared, while the physical mixture with PTX: blank nanoparticles=3:10 showed the characteristic diffraction peak of PTX when 2θ were at 5.575°, 8.970° and 12.495°, which showed that PTX was wrapped inside nanoparticles. This is similar to the result that was reported in the literature that the effective inclusion of vitamin A in chitosan was proved by the XRD method . Figure 15: PTX drug-loading nanoparticles and nano particles blank, the X-ray (XRD) characterization results (from the top in the order: under PTX nanoparticles, PTX: blank, blank nanoparticles=3:10, drug-loading nanoparticles). DSC characterization (taking CHSB with the substitution degree of 6.55% as an example): As is shown in Figure 16, PTX had a sharp melting endothermic peak at 215°C, blank nanoparticles had no significant endothermic peak. The spectrum of the drug-loaded nanoparticles showed that the characteristics of PTX almost disappeared, while in the spectrum of the physical mixture with PTX: blank nanoparticles=3:10, the absorption peak of PTX at 215°C was only slightly decreased. DSC spectrum shows that the drug is not a simple physical mixture between PTX and CHSB, but instead it is loaded in the interior of the carrier material. This can also realize mutual verification with the XRD results, which shows that the drug is encapsulated in nanoparticles. 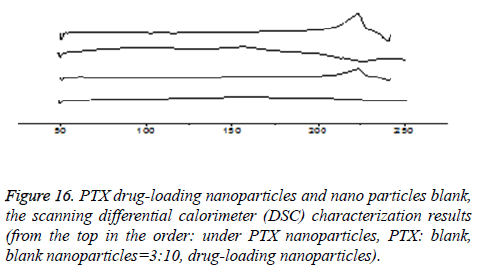 Figure 16: PTX drug-loading nanoparticles and nano particles blank, the scanning differential calorimeter (DSC) characterization results (from the top in the order: under PTX nanoparticles, PTX: blank, blank nanoparticles=3:10, drug-loading nanoparticles). It can be seen from the experimental data that the drug is released in two phases, namely rapid release phase and slow release phase. The release rates of the drug-loaded nanoparticles prepared by CHSB with the substitution degree of 3 were all within 40% in 1 h, which complied with the pharmacopoeia. The drug-loaded nanoparticles prepared by CHSB with the substitution degree (%) of 7.30 had the best release effect, and the drug-loaded nanoparticles prepared by CHSB with the substitution degree (%) of 8.91 was released the most quickly in the early stage. The release rates of three kinds of drug-loaded nanoparticles in 96 h reached more than 95.00% (Figure 17 and Table 4). Figure 17: In vitro release of the nanoparticles prepared by CHSB. Table 4. In vitro release of the nanoparticles prepared by CHSB. Cytotoxicity: As is shown in Figures 18-21, the cytotoxicity test showed that the prepared blank nanoparticles had no toxicity in the set concentration range, which indicated that the carrier material of CHSB had good bio-safety, and was suitable to be used as a drug carrier. The drug-loaded nanoparticles had lethality to QGY-7703 cells within the set concentration range. The lethality was dose dependent: it increased with the increase of concentration, and increased with the extension of time. The drug-loaded nanoparticles had more cytotoxicity than the drug solution with the same concentration, which may be because the uptake of nanoparticles by cells was more than that of free drugs. 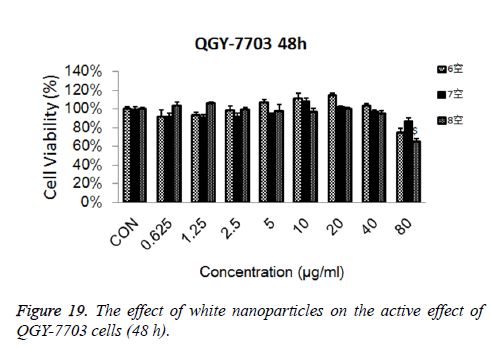 Figure 18: The effect of white nanoparticles on the active effect of QGY-7703 cells (24 h). 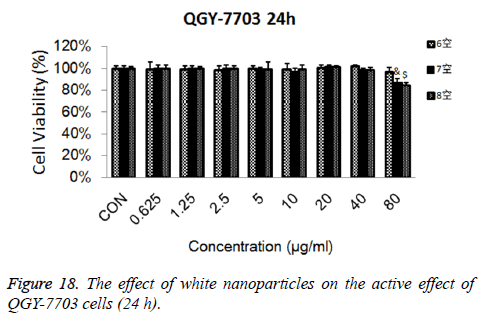 Figure 19: The effect of white nanoparticles on the active effect of QGY-7703 cells (48 h). 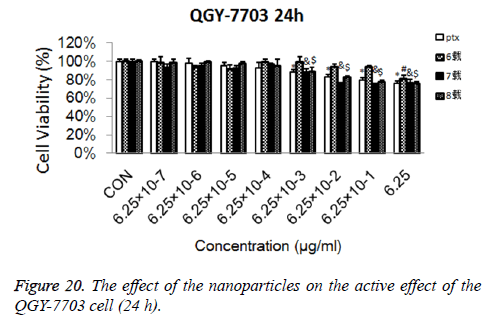 Figure 20: The effect of the nanoparticles on the active effect of the QGY-7703 cell (24 h). 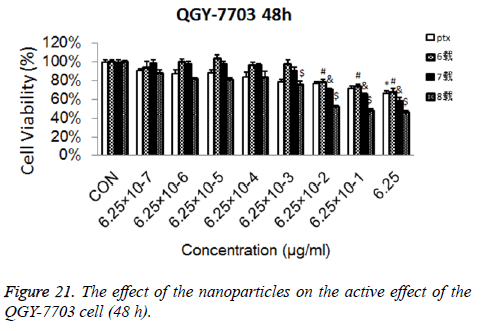 Figure 21: The effect of the nanoparticles on the active effect of the QGY-7703 cell (48 h). The experimental results of cell uptake: Cellular uptake of nanoparticles could be directly observed in an uptake test, as is shown in Figure 22. 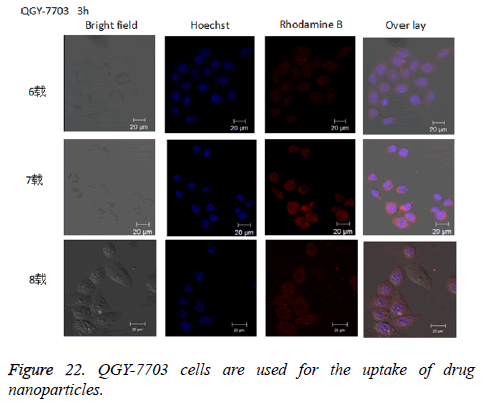 After rhodamine B-labelled drug-loaded nanoparticles were incubated together with QGY-7703 cells for 3 h, a clear red fluorescence could be observed in the cells. Figure 22: QGY-7703 cells are used for the uptake of drug nanoparticles. The study indicated that it was feasible to use the CHSB synthetic carrier materials as a drug carrier. Firstly, CHSB with different substitution degrees were synthesized, and the stability of the synthesis process and the main factors to guarantee the synthesis quality were investigated and the control method was formulated to ensure the smooth progress of the follow-up study. Then drug-loaded nanoparticles were prepared using the dialysis method. Their morphologies, particle sizes, particle size distribution, zeta potential, and other physical and chemical properties were characterized, its drug-loading rate and entrapment rate were determined, and it’s in vitro release and the in vitro pharmacodynamic effects were studied. The experimental results showed that the synthesis process of CHSB was stable and feasible and it was easy to control the synthesis quality; the prepared nanoparticles had good appearance, a regular spherical shape, an even distribution in particle size and good stability. The drug-loading rate and entrapment rate might be related to the drug-carrier ratio. Firstly, the prepared nanoparticles increased with the increase of feed intake and then reached a peak. A lot of nanoparticles were prepared at the selected drug-carrier ratio of 3:10 according to the results of preliminary experiments. In the case of the same drug-carrier ratio, drug-loading rate and entrapment rate were affected by the substitution degree of CHSB within a certain scope. Drug-loading rate and entrapment rate increased with the increase of substitution degree, but the drug-loading rate and entrapment rate of formed nanoparticles might not always increase with the increase of the substitution degree. When the substitution degree was too large the carrier material showed that hydrophobicity was too strong, which was unfavourable for the formation of nanoparticles and drug loading by the carrier materials. The existing state of drugs in nanoparticles was verified by XRD and DSC methods. The drug was entrapped in the nanoparticles rather than simple physical mixing with the carrier material. 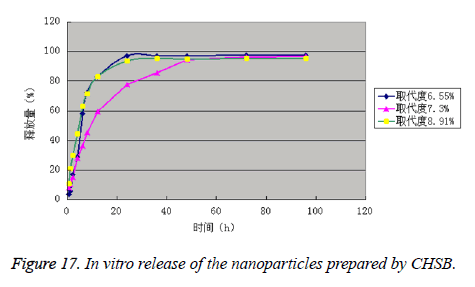 There were two stages in in vitro release of nanoparticles. The release amount of the drug-loaded nanoparticles prepared by CHSB with substitution degrees of 3 was all within 40% in the first 1 h. There was no obvious burst release phenomenon and the carrier material showed certain sustained release ability. The results of in vitro pharmacokinetics showed that the selected carrier materials had good bio-safety and the prepared nanoparticles had some ability to kill tumor cells. It had greater lethality than the solution with the same drug concentration, which indirectly showed that cells more easily absorbed the drug-loaded nanoparticles. The above experimental results showed that it was highly feasible to use CHSB as a drug carrier: it not only had a solubilisation effect on the model drug Taxol, but also made the drug more easily accessible to the cells. In this study, the modified nanometer material was synthesized with Bletilla striata polysaccharide as the initial raw materials, which developed a new thought for the utilization of Chinese medicine resources. Bletilla striata polysaccharide, as a kind of natural polysaccharide, was extracted in a simple process at low cost and it was highly feasible to develop a drug carrier using it as the initial raw material that is suitable for large-scale production. The feasibility to use the modified Bletilla striata polysaccharide as a drug carrier was investigated from the perspective of pharmaceutics and in vitro pharmacodynamics, which provided an important basis for industrial production. Singh S, Dash AK. Paclitaxel in cancer treatment: perspectives and prospects of its delivery challenges. Crit Rev Ther Drug Carrier Syst 2009; 26: 333-372. Feng SS, Huang GF. Effects of emulsifiers on the controlled release of paclitaxel (Taxol®) from nanospheres of biodegradable polymers. J Control Release 2001; 71: 53-69. Nimmanapalli R. Pretreatment with paclitaxel enhances apo-2 ligand/tumor necrosis factor-related apoptosis-inducing ligand-induced apoptosis of prostate cancer cells by inducing death receptors 4 and 5 protein levels. Cancer Res 2001; 61: 759-763. Passarella RJ. Targeted nanoparticles that deliver a sustained, specific release of Paclitaxel to irradiated tumors. Cancer Res 2010; 70: 4550-4559. Wang YS, Liu LR, Jiang Q. Self-aggregated nanoparticles of cholesterol-modified chitosan conjugate as a novel carrier of epirubicin. Eur Polym J 2007; 43: 43-51. Cheng L, Anglin E, Cunin F. Intravitreal properties of porous silicon photonic crystals: A potential self-reporting intraocular drug delivery vehicle. Br J Ophthalmol 2008; 92: 705. Yasukawa T, Ogura Y, Tabata Y. Drug delivery systems for vitreo-retinal disease. Prog Retin Eye Res 2004; 23: 253. Bourges JL, Gautier SE, Delie F. Ocular drug delivery targeting the retina and retinal pigment epithelium using polylactide nanoparticles. Invest Ophthalmol Vis Sci 2003; 44: 3562. Hana HD, Lee A, Songa CK. In vivo distribution antitumor activity of heparin-stabilized doxorubicin-loaded liposomes. Int J Pharm 2006; 313: 181-188. Na K, Park KH, Kim SW. Self-assembled hydrogel nanoparticles from curdlan derivatives: characterization, anti-cancer drug release and interaction with a hepatoma cell line (HepG2). J Control Release 2000; 69: 225-236. Reju GT, Myeong JM, Sejy L. Paclitaxel loaded hyaluronic acid nanoparticles for targeted cancer therapy: In vitro and in vivo analysis. Int J Biol Macromol 2015; 72: 510-518. Prem NG, Sharad J, Chetan N. Development and evaluation of paclitaxel loaded PLGA: poloxamer blend nanoparticles for cancer chemotherapy. Int J Biol Macromol 2014; 69: 394. YanW, Shurong M, Zhongshi X. A synergistic combination therapy with paclitaxel and doxorubicin loaded micellar nanoparticles: Colloids and Surfaces B. Biointerfaces 2014; 116: 41-48. Kim DG, JcongY, Choi CY. Retinol-encapsulated low molecular water-soluble chitosan nanoparticles. Int J Pharm 2006; 319: 130-138.